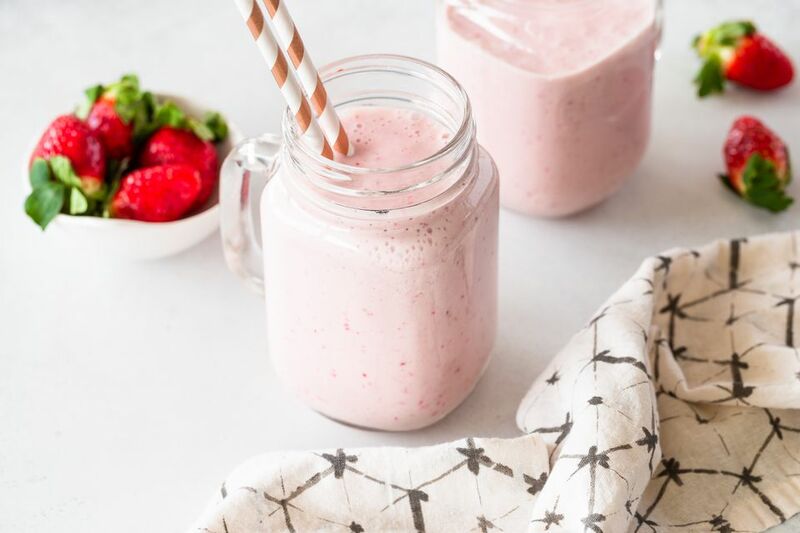 While it’s not necessary to soak the strawberries in the sugar before blending, the sugar really pulls out the berries’ natural juice and intensifies the sweetness in a way that gives your milkshake amazing flavor. You could also use strawberry ice cream instead of vanilla for even more strawberry punch. Cut the tops off the strawberries and slice them into a few pieces. In a medium bowl combine the sliced strawberries, sugar, and vanilla extract and stir to combine well. Set aside and allow to sit, if you have time, for at least 20 minutes and up to 1 hour. Place the strawberries with any juices, ice cream, and milk in a blender. Pour into large glasses, and if desired put a strawberry on the rim of each glass. In place of fresh strawberries, you can use frozen strawberries, either ones that you buy already frozen in the freezer aisle or you can freeze fresh strawberries and use those if you want a very thick shake. You may need to add a bit more milk if the shake is too thick. Feel free to use any kind of milk you'd like, from 1% to whole, although whole would make a richer milkshake. If you are looking to add some more flavor to your strawberry milkshake, try adding a banana, for a strawberry banana milkshake. Include other berries in addition to—or with—the strawberries for a mixed berry shake. Try blueberries, raspberries, and blackberries. Add a scoop of malt powder for a malted strawberry shake. Drizzle it with chocolate syrup for a strawberry chocolate milkshake. Put whipped cream on top, and maybe some chocolate shavings or sprinkles. You could also substitute dairy items with non-dairy milk and ice cream.